Esta entrada fue publicada el Martes, 5th Junio, 2012 a las 11:28 pm	y esta archivado bajo Arduino, Electrónica, Hardware, Programación, Proyectos. Puedes seguir cualquier respuesta a esta entrada a traves de de la alimentacion RSS 2.0. Puedes dejar un comentario, o hacer un trackback desde tu sitio. where can i find the OLED display for delivery to the uk? Great build! What’s the battery life like for this device? Photo is old, but screen module is newer and blue instead red. @Kyle: 1 hour 45 min. Battery is really old, but used that one because it’s perfect fitting size. Nice work! Great workmanship, love the schematic, very nicely laid out. @Luke: Thanks! The schematic was made using paint and pasted photos. @Ethan: Analogs 4 and 5, the usual ones for I2C bus. You can check it at the arduino mini pro layout. Excellent project. It’s beautifully done to get it into a nice tight cube. 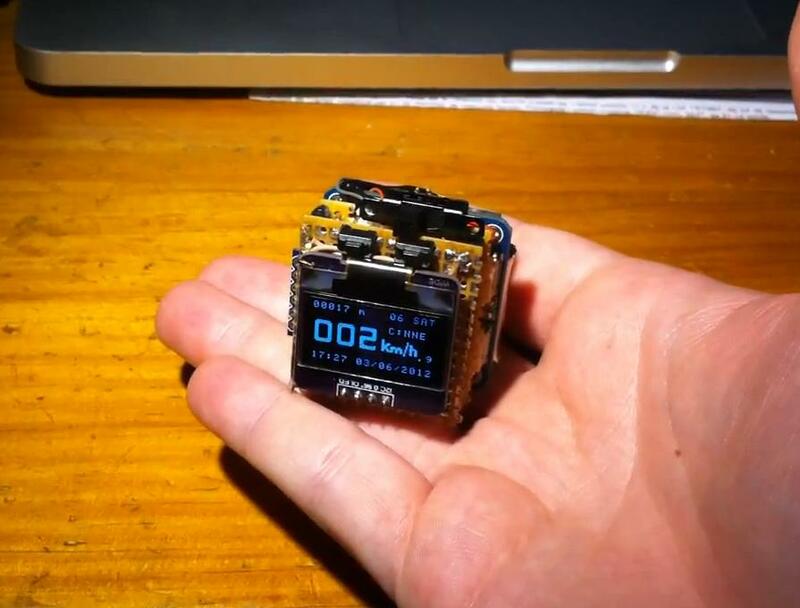 You should have a custom pcb made so it can be even smaller. is it possible to switch the mini for a nano ? There was something I was wondering. It’s usually recommended to have the GPS pointed up, towards the sky. Have you run into any performance issues because the GPS is pointed down? @Tibo: works exactly but is bigger. @Mr. Cruz: maybe in first fix but not usually. I just got in the display from ebay and tried to compile the code using Arduino 1.0.1 but get these errors. Can you help? I’m using the Mini Pro.. I have no clue about ‘declared void’. In the other hand the gps errors comes from not having the TinyGPS library. Please use Winrar, it should open tgz files. thanks a lot for the project idea. 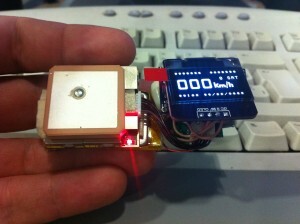 I build the same thing with a other SSD1306 display (http://bit.ly/LwP6Jq). But I get these errors, what I do wrong? 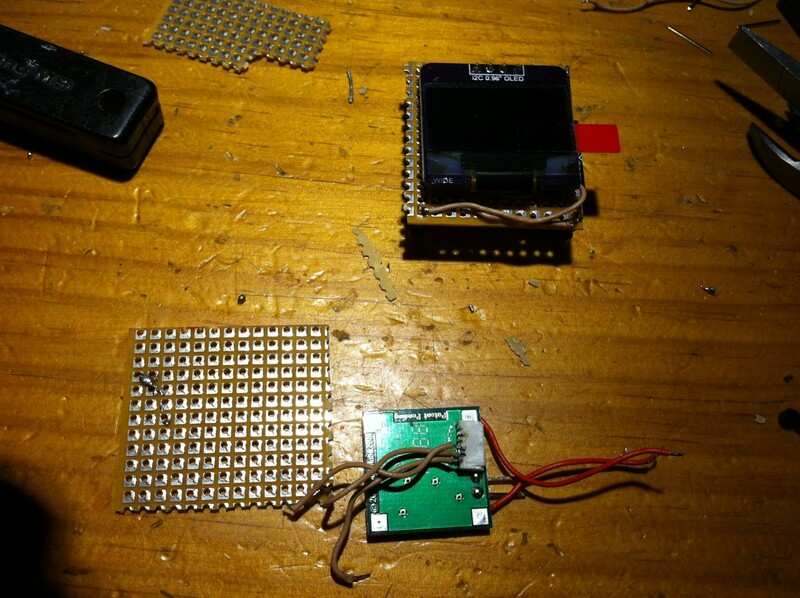 @Gustav: seems you included twice the TinyGPS lib. What software did you use to create the logo that generated hex code? I would like to create my own. That rar contains i2c oled simple example and LCDAssistant.exe. It takes a bmp file as input and drops the hex array as output. 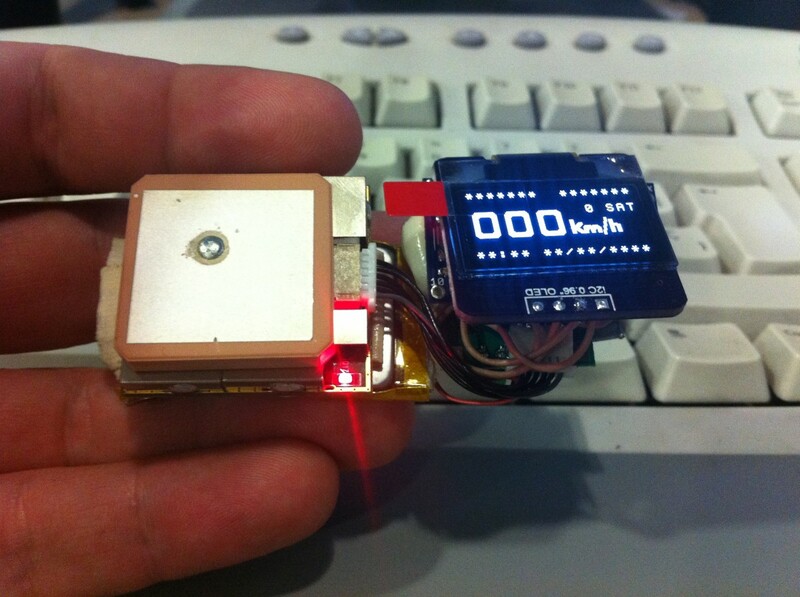 Make sure to use a monochrome bmp sized to your display. Hiya i am reciving this error. can you help me. With the help of Lukas I solved my problems. Put the GPS-Toy file into the files of the Skathbook . All the others (TinyGPS and PinChangeInt) into the libraries of arduino. I am running a 8MHz board. Wokes fine. Thank you. Hi. Nice project! what are the pin names/numbers that connect the arduino and the gps module? It seems only vin, GND and the grey one to arduino pin 4. Is’nt it a serial module? Indeed is a serial port but GPS doesn’t need to be initialited or configured so is not needed to conect tx from arduino to GPS rx. Hello! What a great project!! JUST LOOOOOVE IT!!! And thank you for putting out the code! I am playing with it but don’t know how to code a Skylab SKM53 GPS on it… It irritates me! Any one has a clue? Please help! Didn’t u think about it? My modifications are just to disable interrupts on unsued port. Should work if you’re attaching your TX-RX GPS on same pins. How quickly does it give you your speed and how accurate is the speed it is giving you? is it only based on GPS or do you have another way to measure that you are moving? The ultimate prototype has 0.5 km/h acuracy, acording to GPS manufacturer. About the speed, I think is about 0.5s for display refresh. This speed is given because atmega is busy reading the serial port. It can be speed up by connecting the GPS to the built in serial port instead of using softwareserial. I am very interested in your project . ie: heading, distance, and time according to the speed . This is what I need but only speed and maybe clock. I want it for my motor cycle helmet so I’d need the gps mounted on outside of helmet and all other pieces next to each other to hide behind foam except screen. This would be an awesome thing to post on Instructables.com if you’d write up for speedometer only I know lots of motorcycle guys who would love this. Hello, i have a question about this GPS. Is it possible to have a 5Hz or 10Hz refresh rate ? I need to measure max speed of some RC Offshore, 1Hz is not very accurate. Thank you for this information, one day perhaps. Hello, confratulations, great project I also want to make swatch for runners with gps to improve skills in my football team;) so i have question if you can sent me your schamatics, and C – code if it is not problem for you. Best regards, Maciej! I too and receiving this error when trying to compile. You just need to download and install the tinygps library. Yes, I have it, I included the files into the arduino folder, do I have to enable or uncomment something in the code? Please, ensure that the library is properly installed by opening any included sample sketches and trying to compile them. Great GPS! I want to make a same for an HUD glasses for skiing! I have buy all components! Please can you send me your program for arduino? Built on off you cubes, and everything works… but my display is off by 4 pixels to one side !?!? Where can i modify code som that Oled shows the right pictures ?? Would someone kind help me.! it was a hard fight to awake the hardware and to upload the software code! Now it is “syncing” … someone an ides, how long this could take? (GPS is green / blue blinking). Is there somewhere an IOM how to operate the GPS toy? This GPS works well, but the date remains to zero (00/00/0000), can it be fixed ? you have to wait a bit for it to appear. I try to comply the code many many times, but I keep getting the following compilation errors. Q1) What Arduino ID version should I use ? Q2) What PinChangeInt version should I use ? I try to comple the code many many times, but I keep getting the following compilation errors. For those who successfully compiled the code, would you please answer the following two simple question. 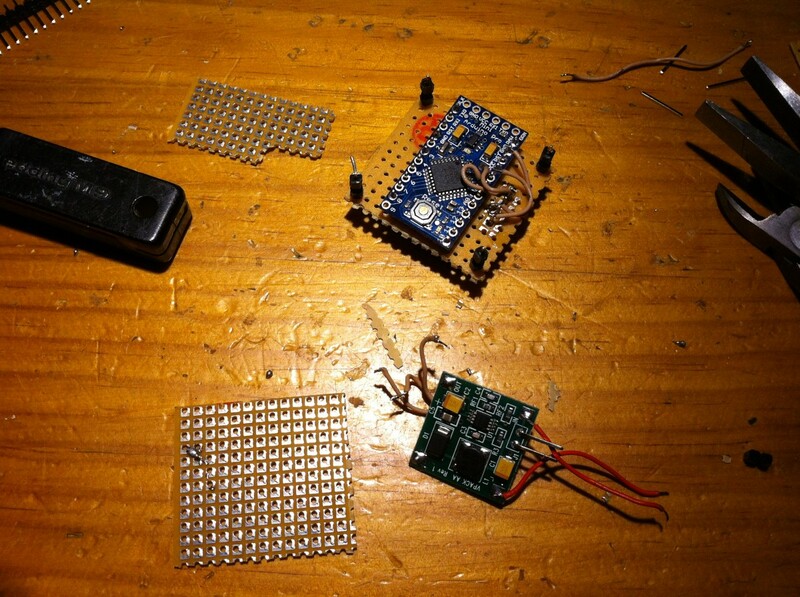 Q1) What “Arduino ID” version should I use ? Q2) What “PinChangeInt” library version should I use ? I am really impressed by the GPS Toy. All libraries seem to be in appropriate folder. But i have a problem when I take off 5v. and start once again on the Arduino. then the LCD screen does not turn on only after a clear EEPROM and a new upload. does anyone know how this could have an OLED 1306, the same as you build. I tried to do this nice project but i have problems. After i upload firmware and switch off power on the LCD no image. it seems i have problems like Steef. i have a problem. after upload the sketch all is running. but if i disconnect the power and power it up again (the time between off and on doesnt matter) the display will show nothing. what did i wrong ? Built on off you cubes, and everything works… but my display is off by 4 pixels to one side ?? Hi, I have trouble when try to reset and I change magic number and now after boot I see the screen with speed ( time an data ). I dont have posibility to go in other screen menu no matter whitch button pressed. Appears GPS logo and after that http://www.karman…then speed menu again.I check and recheck the schematic of the buttons but everything seems to be ok. Have you any ideea ? (This problem is before changing the eeprom number). Emil sounds like a random reboot. Try looking for some program to erase the eeprom then flashing again.